No more dolls for girls, trucks for boys – this gorgeous Clan block kit is a fun wooden toy to be enjoyed by all, boys or girls, young and old! 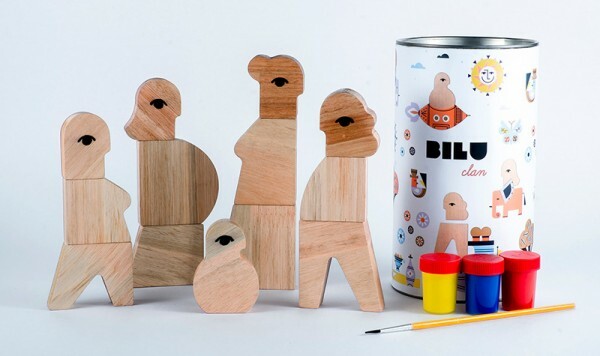 Bilu is an Uruguayan brand focused on toy design and breaking down gender stereotypes associated with children’s play. Upon opening your Clan tin you’ll discover 13 magnetic wooden shape pieces, three washable paints and a paint brush for your child to get busy flexing their artistic muscle. This is a toy that not only encompasses a touch of craft, it’s bound to spark creativity and ignite young imaginations as kids play with the magnetic wooden shapes. Magnets are always great fun, and kids love determining which ones repel and which ones attract each other. Thanks to the lacquered finish and the washable element of the paint, the eco-friendly wooden head, torso and leg shapes (and a baby!) can be washed clean and quickly dried, ready for the next mini artist to have a go at creating their perfect Clan. If you’d love to buy a Clan set for your very own clan, be sure to make your pledge on Bilu’s Kickstarter campaign. A basic set is priced €49.